Maksymiuk, Katarzyna. Geography of Roman-Iranian Wars. 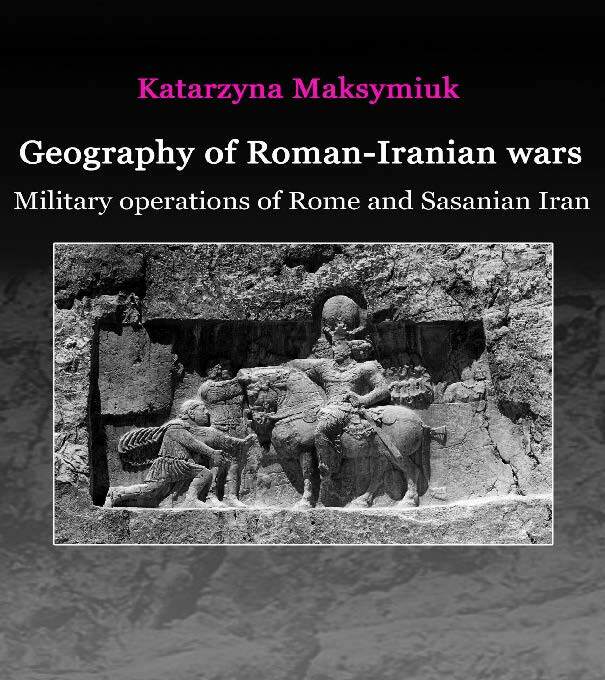 Military Operations of Rome and Sasanian Iran. Siedlce: Instytut Historii i Stosunków Międzynarodowych Uniwersytetu Przyrodniczo-Humanistycznego w Siedlcach, 2015. Until the second half of the second century AD the border between Rome and Iran was marked by the Euphrates, with Mesopotamia regarded as an integral part of the Parthian state. In 224 AD the power in Iran was taken over by the Sasanians, who sought to regain influence over the territory previously ruled by the Parthians. The change of the dynasty in Iran was perceived as a threat to the position of Rome in the Near East. It has result a series of conflicts resumed shortly after the overthrow of Parthian rule and Ardašīr I’s foundation of the Sassanid Empire, known as Roman–Sasanian Wars. This book is an expanded english translation of the in 2012 published original Geografia wojen rzymsko-irańskich. Działania Rzymu i Iranu w okresie sasanidzkim in Polish. The present work is primarily addressed to students and scholars of history. It presents a valuable collection of designing maps depicting topography of Roman-Iranian armed conflicts. The maps have been created on the basis of source texts reporting wars waged by Rome against the Sasanian Iran and only the towns and provinces which were mentioned by ancient writers while reporting specific conflicts have been marked. Moreover, the present work contains only maps of military operations in which Roman and Iranian armies directly participated. The maps have been divided into three categories. The first of them is devoted to military conflicts, the second group concerns territorial changes resulting from the peace treaties while the third collection includes maps depicting changes to the Roman-Iranian border in particular time periods, a map showing territories of the Naṣrids and the Jafnids as well as a map of the Roman defense system in the south, known as Strata Diocletiana. Each of the maps is accompanied by a short description and references to the source texts on the basis of which it has been constructed. The book is available via the academia personal page of the author. Katarzyna Maksymiuk is a scholar of History of Ancient Near East and the member of the Department of History and International Relations, University of Natural Sciences and Humanities in Siedlce, Poland.